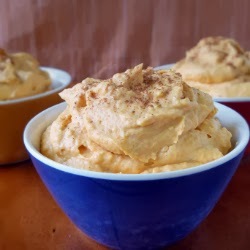 Mix canned pumpkin with Zero fat Cool Whip and a large fat free vanilla instant pudding (adjust amounts to taste) Makes Pumpkin Fluff, low cal and yummy! Beat all ingredients together. Spray pie plate with cooking spray. Pour batter into pie plate and bake for 15 minutes at 400°. Reduce heat to 350° and bake for an additional 45 minutes or until knife inserted in center comes out clean. Top with a dollop of fat-free whipped cream (not included in nutritional information). "Serving size: ONE QUARTER OF THE PIE! WHOO HOO! Go ahead ... have seconds! Mix first five ingredients together in a bowl for two minutes. Hold a long tapered glass at a slight angle. 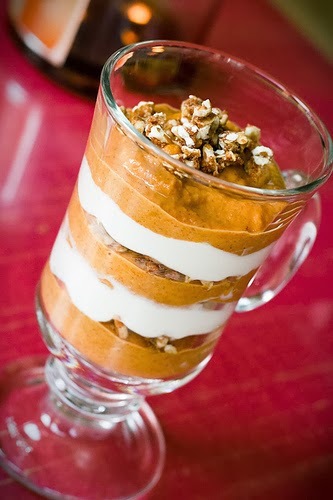 Spoon ½ cup of pumpkin pudding mixture into the bottom. Top with with 1½ tbsp fat free whipped topping . Repeat layers. Chill until ready to serve. The hardest part of this recipe is not getting the pudding on the side of the glass. Spoon slowly and carefully. Wash potatoes and cut into large cubes, but don't peel. Place in a large pot, cover with water and boil until tender. Drain. Beat with an electric mixer on low, or mash remaining ingredients together. In a medium saucepan, mix cream of chicken soup, chicken broth, Gravy Master®, garlic powder, poultry seasoning and pepper. Heat and simmer for 7 minutes. In a small bowl mix together nonfat milk and cornstarch. Bring gravy mixture to a boil and gradually stir in the milk mixture. Continue to cook, stirring constantly for 1 minute or until thickened. Be careful not to let the bottom scorch.